Two kids from the girls high school track team showed up next. In my county election workers actually get paid a small amount ($120) and since it is a school holiday a lot of kids find it an easy way to make a few dollars. Mary assigned them both to the voting machines. Their job was to make sure that after each voter finished in the voting booth that the counter on each machine advanced by one. And that’s all they did for thirteen hours. Mary had me post the numerous voter information notices and the sample ballot at both the entrance to the church and just before voters would go to the voting booths. There were five or six different notices in both English and Spanish all in small fonts. It probably would have taken an hour or two to read it all. While I was doing that ‘David’, ‘Mike’, and ‘Jennifer’ showed up. David was a supermarket manager who had been working as a poll worker, every election and primary, for the last 20 years, Jennifer worked at the local elementary school cafeteria, I’ve forgotten what Mike said he did but he was married to Mary who was the school librarian. They had each worked at the same polling place for at least the previous 10 years. I was definitely the newbie. The five of us sat at folding banquet tables and greeted voters as they came in. We asked for their last name and then looked them up in the district’s registered voters books. When we found their entry we asked them to sign their name and then sent them to the voting booths. The names were then copied down onto the master list and enumerated. 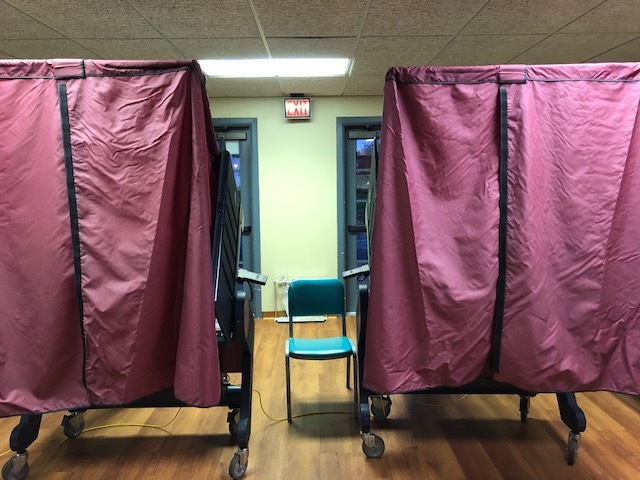 At 10am, 2pm, 6pm and at the close of the polls the number on the voting machines would be compared to the number of voters that had checked in. In our district it matched every time. I asked Mary what happens if it didn’t match, she said it had never happened before but that she could call the county and they would tell her what to do. When the polls opened at 7am there were about 6 people already in line waiting to vote. From then on for the next 13 hours we sat and looked up approximately 400 names in the book. We had about 1000 registered voters in our district so we ended with a 40% voter turnout, which the old timers told me was about double the average for an off year election in the rain. One of the better things that happened during the day was a mom who brought her son in for his first election. She was so excited, taking selfies with him, telling everyone that it was his first election. Both of them were well known to the other poll workers. The mom had brought her son in when she voted in every election for the previous 18 years and now it was finally his turn. He was partly embarrassed by having his mom gush all over him and to me he also looked partly nervous. Witnessing that one event really made the entire day worth it. Later in the afternoon we looked up one gentleman’s name only to find that someone else had already signed the book in his place. The gentleman recognized the signature as that of his father who had came in to vote earlier in the day. No one really knew what to do, evidently this had never happened before. So the judge of elections called the county and they told us that the father wasn’t actually registered to vote at all and told us to just have the son sign the book in the same block and let him vote. I have no idea what the county ended up doing with that extra vote. State issued ID they accept your voter registration card, a utility bill, or even a library card as valid ID. I was really surprised at how many people just voluntarily brought out their IDs and shoved them at us without us even asking for them. There was one new voter who had come in with her family who did not bring ID. Her father was shocked to find out that his daughter needed ID at all since he had never had to show it. The daughter was like “That’s alright dad, it’s no big deal, I’ll vote next year.” But the dad wasn’t having any of that and had his daughter wait there while he drove home and got her ID. I was happy to have witnessed that. 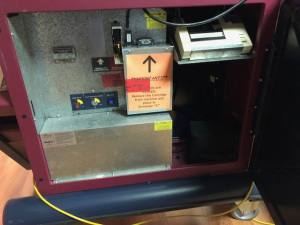 In the early evening a woman came out of the voting booth and complained to Mary, the Judge of Elections, that the voting machine on the left wasn’t working properly. 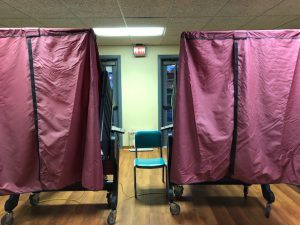 The woman claimed that it was hard to get the machine to register her vote and that she had to push the button three or four times before it it would indicate her choice. Mary went and checked the machine and told us the machine was working fine and the issue was probably user error in not pushing in the right place on the machine. 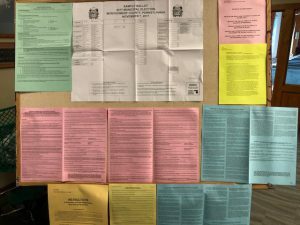 Before the polls had opened that morning the two voting machines had been zeroed out and their vote tallies printed out, in triplicate, showing all zeros. Then when the polls closed each machine had its vote tallies printed out again, in triplicate. The five of us signed all six receipts and placed them in the appropriate envelopes to be sent to the county board of elections to be added with all the other districts results. So I guess the really big question is if I was a bad actor could I have somehow altered the vote count in my district. Unfortunately, I think I would have to say yes, it would have been possible. Assuming I could do something in say under a minute I think I could have gotten that amount of time alone with the machine. But there were only ~1000 registered voters in my district so any altering of votes at the local level would have minimal impact and it would be very difficult to scale. But doing a security review of the voting procedures in my local district was not why I was there. Despite it being a very a long day and not really knowing many people in the community I actually found the day to be quite enjoyable and eye opening. It did not change my opinion as to the sanctity of the voting process but doing a security assessment was not my goal that day. 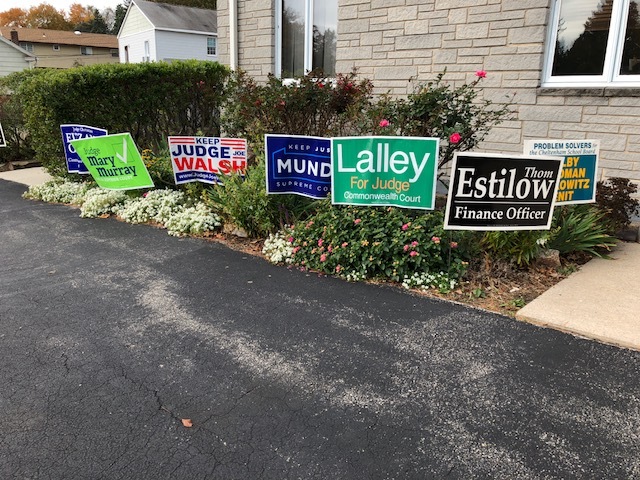 There may be issues at the county and or state levels but at the local level I feel very confidant in my neighbor’s abilities to properly count votes.